This slingshot game is a similar concept as Angry Birds but instead of birds it has witches and instead of pigs it has flying monkeys. The game uses Leaderboards and Achievements using Apple's “Game Center”. 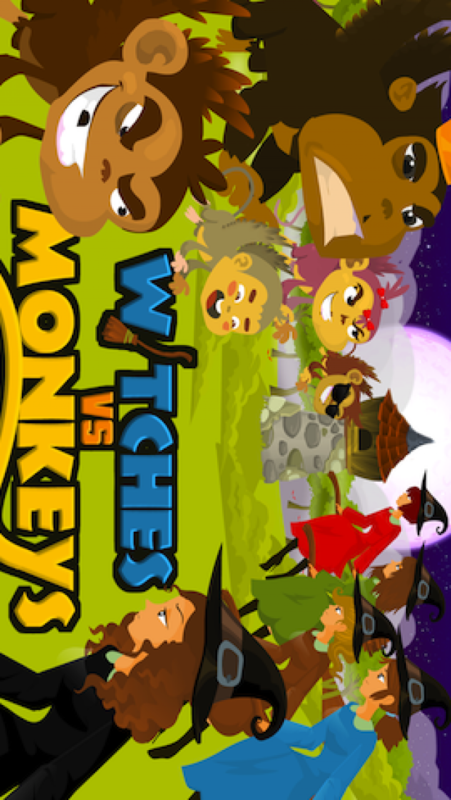 Guaranteed to provide hours of fun, “Witches vs. Monkeys” has 30 exciting and challenging levels. There are 5 different witches types and some of them are stronger than others. for example: Red and Black witches are strong. Blue and Green witches are weak and Brown witch is medium strength. There are 5 different cheeky monkeys characters including male, female, king, younger male with sunglasses and baby monkey. All characters are animated. Player shoots witches from a slingshot and need to aim on the monkeys to clear each level. Some monkeys need to be hit a few times before they are destroyed. Player can also collect certain items for extra points by shooting witches to that object's direction such as witch's pot, crystal balls, treasure chest, gold bars, candle holders, rubies, diamonds, precious stones and more. The free version comes with 5 levels that are available. Player needs to get enough points on each level to move to the next level. There is an option to purchase the full version for $0.99 that contains 30 levels. The levels are divided into 5 worlds that are called Seasons: Spring, Summer, Fall, Winter and the last world is called 'Season of the witch'. The monkeys are hiding in different stacked objects the materials are different such as wood, glass, stones, pillars etc. Each level is more complicated and requires a different strategy to get enough points and move to the next level. The game keeps track of high scores for each levels for the current player and in addition the player can compare his high score to other players using the Game Center leader board. Also using Game Center players can challenge friends or receive challenges from friends to beat their scores or earn achievements. When the witches are thrown from the slingshot you'll hear a famous witch's laugh and the witch will fly on her broom. The amazing graphics and artwork make this game unique and the character likeable. Fans of the game can purchase t-shirts with their favourite W. vs. M. characters on an online Spreadshirt Shop.